Use tried and tested teacher interview tips to get the teaching job you want. Learn how to set yourself apart from the other candidates applying for the same teaching opportunity. Find out how to prepare for your job interview and come across as a confident and competent teaching professional. 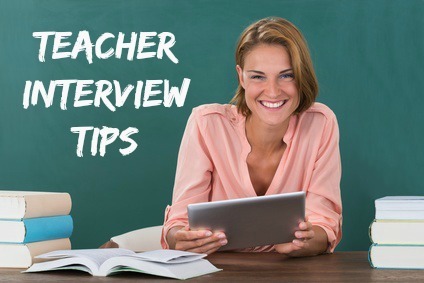 These top 10 tips cover all the key aspects of your teacher job interview. Use social media, the internet, friends and teaching colleagues to find out as much relevant information about the school district before your interview as you can. Gather printed materials at the school district office. Speak to a teacher. Use social media. Focus on details like the school demographics, student achievement, its philosophy, extracurricular activities, special programs, school initiatives, staff etc. The more research you have done the better equipped you will be to answer and ask the right questions. The more you know about the school district, its students, and its curriculum, the better prepared you will be to prove that your skills and abilities match their needs. View this guide on putting together your teacher portfolio. Don’t wait for an interviewer to ask to see your portfolio, rather be ready to pull out examples of your work whenever something in your portfolio relates to what is being asked. Interviewers will be impressed by your planning and preparation. This will set you apart as prepared and professional. Use this guide to answering teacher interview questions to help you. Practice your answers, conduct a mock interview with friends and family. You will be asked a number of behavioral-based interview questions in your teacher job interview. These behavioral questions explore the core teaching competencies required for successful job performance. Have your stories ready. Prepare for the frequently asked interview questions you are likely to be asked in your teaching interview. View this complete list of sample job interview questions to help you with your preparation. Prepare a list of thoughtful and relevant questions to ask in the teaching interview. You want to look professional and make a good first impression. For a teacher position more conservative and formal is the safest bet. See the advice given in job interview dress code to help you select the appropriate attire for a teaching job interview. Particularly important teacher interview tips include checking that your public online image is appropriate and one that you would be happy for a prospective employer to see. Click on tips on job interviews to find out how to ensure your email address, voice mail and social networking profile will not derail your chances of getting the teaching job. During the teaching interview smile, speak positively, and use your body language to express your enthusiasm for the position. Enthusiasm is key to successful teaching. View these expert tips on interview body language to send the right message. 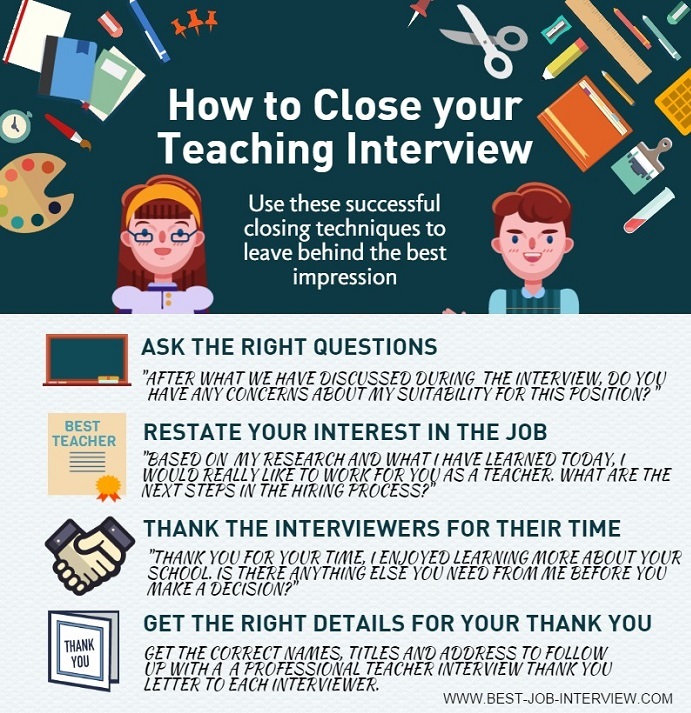 Teacher interview tips for establishing a good rapport with your interviewer. Always send a thank you letter within 24 hours of your teacher interview. Use the sample teacher interview thank you letter to help you write a convincing follow up letter. Follow the teacher interview tips and be sure that you come across as the best candidate for the teaching position. Expect the interview questions that explore your motivation and strengths as a teacher. How to answer teacher interview questions about classroom management and discipline.